Every 40 years or so New York sheds its skin with a burst of public and private investment in transportation infrastructure. At the turn of the last century, New York built much of its remarkable subway system, which helped make the city one of the world's greatest. In the 1940s, '50s and early '60s, Robert Moses was responsible for a massive expansion of New York's transportation infrastructure until New Yorkers finally rebelled against his refusal to address the human costs of his projects. Nevertheless, Moses helped further build the New York region into an economic powerhouse. Now, as the 21st century dawns, New York must once again make major investments in its transportation system which will fuel the region's economic growth for the coming decades. Between 1990 and 2000, New York City's population grew by about 800,000 people and the metropolitan area grew by over 1 million people - more growth than our region had seen in decades. And that growth is being fueled largely by two dynamic groups of people - new immigrants from all over the world and creative, well-educated, young people flocking to New York from all over the country. Both groups of newcomers have spurred a fantastic renaissance of so many of our city's neighborhoods - Harlem, Green Point, Williamsburg, DUMBO, Red Hook, Bedford-Stuyvesant and even the South Bronx. To make sure these newcomers succeed, our city must grow and must create new jobs. And I believe that we cannot grow without significant new investments in transportation, without which we will literally and economically stand still. And in today's competitive economy, to stand still is to die. I believe we have a rare moment here in New York - we have strong political consensus on a number of key projects needed for our region, including East Side Access, Second Avenue Subway, linking Lower Manhattan with Kennedy Airport, extending the number 7 Line to the far west side, and the cross-harbor freight rail tunnel. And now in a moment of great serendipity, there are a number of federal pots of funding that we can access. I believe that, if we all work together, we can succeed in this unique moment in securing the funding needed to build all these important transportation projects, without tapping too deeply into city or state coffers. After September 11, one of my top priorities in my negotiations with the White House was to ensure that we could radically remake the transportation system of lower Manhattan. Initially, there were strict rules about the use of federal disaster funds for transportation projects. Those funds are to be used only to restore the affected transportation infrastructure to its pre-disaster condition. Related: Transportation And Lower Manhattan: Where Do We Go From Here? And while that may make sense in the case of a hurricane, it made no sense at all for lower Manhattan, with its maze of disconnected and antiquated and sometimes-redundant subway lines, lack of a centralized concourse linking the subways and PATH, and its lack of a connection to Kennedy Airport. To just rebuild to a pre 9-11 state would be a wasted opportunity. I was able to help convince the Bush administration and my colleagues in the Congress to change the rules for New York and provide us with an unprecedented total of $4.55 billion to be spent on new transportation projects. 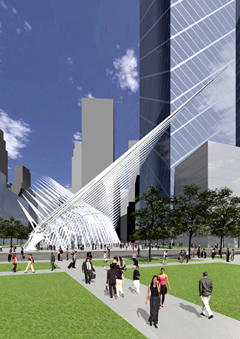 The permanent PATH station at the World Trade Center site, the Fulton Street Transit Center, and the South Ferry station rebuild are all on track for completion between 2006 and 2007. These projects, which will cost about $2.85 billion, will significantly improve access and mobility in Lower Manhattan. And, we still have approximately $1.7 billion left for other transportation projects. We also have approximately $1.2 billion in unspent Community Development Block Grant funds available that the Lower Manhattan Development Corporation has set aside for the JFK rail link. Additionally, we are working hard in Congress to convince our colleagues to provide New York with additional transportation funds to make up for the portion of post-9/11 tax benefits that we did not fully utilize. Downtown Manhattan has not grown like midtown, or even downtown Brooklyn, in part because of its inadequate transportation infrastructure. Without easy connections to the major transportation hubs - Penn Station and Grand Central - or to the airports, downtown has suffered seeing many of its businesses migrate to midtown or out of the city. We must improve its transportation links to the rest of New York, with a connection to Kennedy Airport and the labor pool of Long Island, which is especially important to businesses considering staying or moving to Downtown. To thrive in today's global economy, businesses must be able to draw from a wide, highly-educated labor pool and Long Island represents an essential source of workers for downtown's businesses. I believe we have a once-in-a-generation chance to connect downtown to Kennedy Airport and Long Island, which will spur new business development, create jobs in downtown, and ensure the entire New York City region's economic growth for generations to come. The governor intends to announce his proposal to provide a rail link from Kennedy Airport into Lower Manhattan, however, the funding of their proposal is still under consideration. Governor George Pataki supports using those remaining $1.7 billion in 9/11 transportation funds to build a $900 million tunnel under West Street and a bus facility and related infrastructure. I share the long-standing desire to knit together downtown with Battery Park City and the World Financial Center. And I wholeheartedly agree that we must create a fitting site and design for the memorial for the fallen heroes and victims of 9/11. But I believe that dedicating $900 million of our remaining federal dollars to burying four blocks of West Street cannot be a higher priority than linking downtown to Kennedy Airport. I also am convinced of the absolute importance of connecting the far west side of Manhattan with the city's subway system. It is the key to opening the area up to successful residential and commercial development. That is why I am a zealous and passionate advocate on extending the number 7 subway line. It is my number one goal for the development of the far west side and, to me, the most important part of the mayor's entire proposal. Perhaps most indicative of the importance growing the number 7 line westward is the experience of Canary Wharf. Canary Wharf, London's largest new office complex languished until the London government built a new underground subway line to it. After the tube connected Canary Wharf to the rest of the city the complex took off, it is now one of London's most successful. This should be a stark lesson to all of us: build the 7 line west and the far west side will flourish; don't build it and very little else will happen. Yet, I fear it is the part of the proposal least likely to get built. The mayor's far west side proposal relies upon approval by the City Council for the zoning changes needed for the new commercial and residential development and the extension of the number 7 Line. Approval by the State Legislature is needed to expand the boundaries of the Javits Center and to levy the hotel tax needed to fund the expansion. And the mayor, governor and comptroller must all approve the use the $350 million in Battery Park City funds for the Javits Center expansion. In truth, and by design, the only part of the proposal that does not require additional approvals is the New York Sports and Convention Center. There are many obstacles that could stand in the way of the 7, the rezoning proposal and even the expansion of the Javits Center. The City Council, which must approve any zoning changes, will no doubt have their own ideas about how much development they want on the Far West Side and may not want as much commercial real estate. They may decide to scale down the amount of space - commercial, residential or both - so that the revenue streams from the new taxes those buildings bring in are insufficient to pay the bonds that finance the number 7. Or the economy could slow, reducing the revenues the city receives from the development. And certainly the legislators in Albany will want to put their own ideas into the proposal. I want to be sure the number 7 goes forward, even if other parts of the proposal change or falter. Even if it means the MTA has to reexamine their capital plan. I think the financing plan for the commercial and residential portions of the plan seems promising and I credit the city with looking at creative financing mechanisms. However, I do think the plan requires a thorough debate and testing of its economic and financial assumptions. If the level of real estate tax revenues fails to materialize, how with city adjust its vision for the area? And how will plans for the number 7 be affected? I see such potential with extending the number 7 to further connect the major transportation facilities - Grand Central Station, Penn Station, the new Farley Building Station and the Port Authority Bus Station. Unfortunately, the MTA and the city report that it appears operationally difficult and expensive to extend the number 7 from Times Square down Eighth Avenue to Penn Station and then over the Javits Center, although they have not provided detailed cost estimates. But I would like to propose that we take another look at this element of the proposal. The benefits of connecting Grand Central and Penn Station to the far west side strike me as very significant and potentially worth the higher price tag. I am reserving judgment on the proposal to build a New York Sports and Convention Center. I stand ready to listen to the passionate public debate that will no doubt ensue on this most controversial element of the proposal. Given that the New York Sports and Convention Center appears ready to move ahead with any further public action, I intend to devote my energies to the number 7 and the Javits Center. I want to make sure that those projects get adequate discussion and attention, because thus far all eyes have been far more focused on the much more controversial stadium. If any element of this plan proceeds without a strong commitment to extending the number 7 subway, I will not be able to support the plan overall. We must think big. Rarely does a city have the chance to remake itself, to make fundamental and long-lasting changes. We can continue to use our funds to pursue small, but worthy projects, or we can do something grand keep our City competitive for the next generation. I believe we can and must make significant investments in New York's infrastructure in the next 20 years to create those jobs. This is crucial time to take stock of our post 9/11 recovery efforts and then look to New York's future. If we join together we can create jobs and build the necessary transportation infrastructure to ensure our city and region's long-term economic growth and competitiveness. We are potentially facing a once-in-a-lifetime chance to expand our city and create something of lasting value for generations of New Yorkers to come. Adapted from an address delivered at the Regional Planning Association conference on April 16, 2004.